Louie Leech is from Fairmont (South Central) Minnesota. An estimated 2000 decoys were made by Louie Leach. 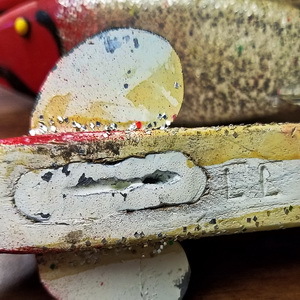 One method to identify a Louie Leach Decoy is by the “LL” initials in the wood of the belly. Ther Red, White and black with silver fleck paint job is usually a definte identification method along with the initials. I got into ice spearfishing and carving through other spear fishermen. I became good friends with Ron Dickenson of Fairmont, Minnesota. Ron Dickenson spear fished most since a boy and is now retired. Louis Leech, also from Fairmont, and a well know fish decoy carver. Ron stated that he had helped Leach made many of his decoys. According to Ron, Louie Leach was born in Atwater, Illinois in 1905 and, along with his parents, two brothers, and three sisters, moved to Heron Lake, Minnesota in the 1910’s. Louie and his brothers, Lester and Nester, became well-known and respected guides, hunters, and fishermen growing up, Huckleberry Finn-like, on the numerous lakes in southern Minnesota. The family eventually grew to total of nine members, which required the supplemental fish and game provided by the Leach brothers. During World War II, Louie moved from Heron Lake to Fairmont, MN, in 1941 to work for Stokley Van Camps Canning Company. decoy could be easily acquired in trade for a cold “near” beer. Louie’s decoys were completely handmade from small rectangular pieces of lumber, then often carved and painted to look like suckers. Colors were usually a red head and a white body, with black and white stripped tin fins and tails. Other body colors have been found and used for spearing at different times of the day. 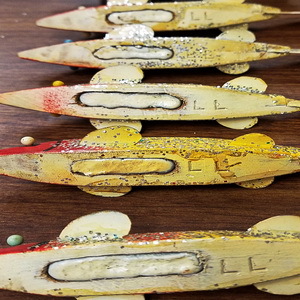 Leach sealed most of his decoys with clear shellac and when this last coat was tacky, silver glitter was applied to simulate scales. The tin and scrap lumber for his decoys may have originated from Van Camps canning factory. 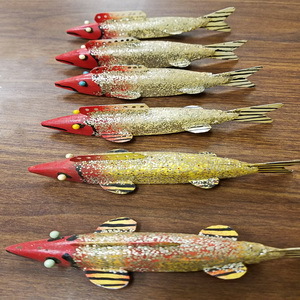 He made about 4 to 5 different decoy sizes, ranging from 2 1/2″ to 13″ inches in length, and many are stamped with his initials “LL.” Leach also made some 3 to 4-inch decoys with hooks, which Leach called “cheaters,” since fishermen couldn’t legally use hooks on spearing decoys. 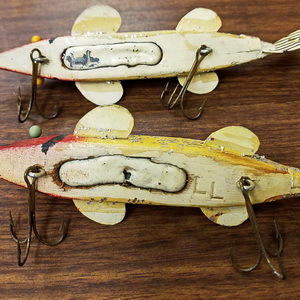 When using Leach’s decoys, fishing line was tied to the decoy hanger and a jigger pole or to the rafters of the fishing hut, and the tail fin of the decoy was bent so the decoy would glide in a circle when dropped in the water. The more the tail fin was bent, the faster the movement and smaller the circle. Large sport fish were speared, as they were attracted to the decoy and its circular movement. 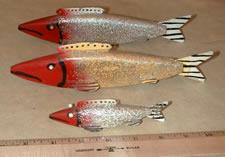 Leach may have made as many as 500 to 1000 spearing fish decoys although were very functional and few survive today. 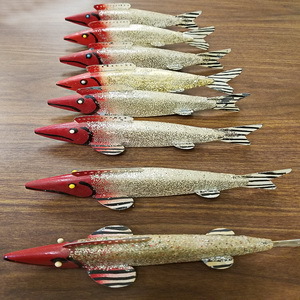 His decoys were very popular with fishermen to attract the large aggressive musky and Northern pike for spearing during the winter harvests. 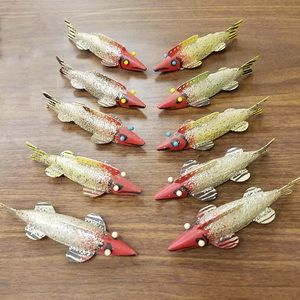 Leach’s “glitter fish” as they are known, have become fairly difficult to acquire, especially since they were such good fish attractors and not that many have survived. 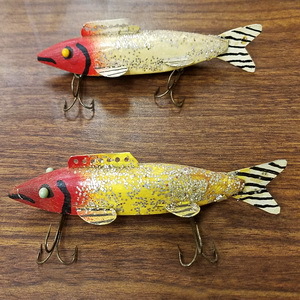 Following Leach’s death, it was fortunate that a few hundred of his fish decoys and a few fish decoy mobiles were discovered in his basement in mint condition. Louie and his brothers Lester and Nester were well-known and colorful characters in and around Fairmont, Heron Lake, and Martin County, hunting, fishing, and selling boats and lures part-time. One of Louie’s best friends and co-worker at Van Camps cannery was Maurice “Blackie” Theobald, who owned and operated a tavern and bait shop in Fairmont in the early 1950’s, located across from the National Guard Armory on Lake Avenue. This was a local hangout for Louie and their fishing buddies and Blackie sold bait from Blackie’s Garage and Bait Shop south of Fairmont on Highway 15 south of Fairmont, MN, across from Interlaken Park Amusement Park. According to Ron Dickenson, Louie’s wife, Shirley, had about 200 decoys left after Louie died, and he purchased them. According to Ron Dickenson, his brother, Lowell Dickson, who was also Louis Leach’s son-in-law, use to help Louie make his decoys. Mr. Dickenson marked the purchased Leech decoy with an “LL,” the initials of Louie Leech.